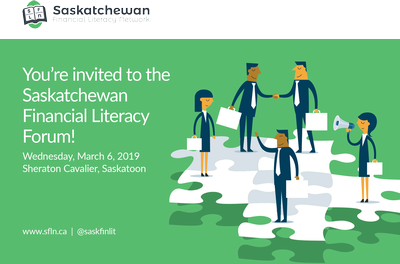 The Saskatchewan Financial Literacy Network (SFLN) is the champion for Financial Literacy across Saskatchewan, and is dedicated to providing you with the resources you need to become financially responsible and build your financial strength and independence! 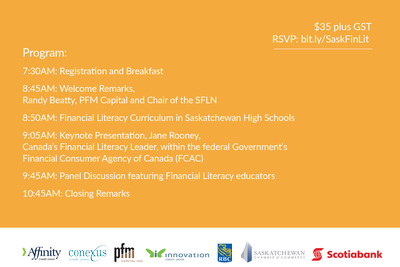 The SFLN’s first event for 2019 will cover the inclusion of Financial Literacy into Saskatchewan’s high school curriculum, feature a keynote presentation from Jane Rooney, Canada’s Financial Literacy Leader, and will end with a panel discussion featuring experts in Financial Literacy education. This event is open to everyone and is an opportunity to become part of Saskatchewan’s Financial Literacy Network. Please list any dietary restrictions on your registration form.